This study is about a new type of honey bee product collected from one of the desert plants – Zygophyllum album L – in Algeria. Zygophyllum album L honey is not a common product; it is very rare and contains elements of nutritional and biological importance according to this study. Zygophyllum album L, is a shrubby plant belonging to the Zygophyllaceae family. Zygophyllum album L is widespread in the deserts and salt marshes of southern Algeria. The leaves, stems, and fruits of this plant are used in Algerian traditional medicine as a drug active against rheumatism, gout, and asthma. Zygophyllum extract is also utilized as a diuretic, local anaesthetic, antihistaminic, and antidiabetic agent. 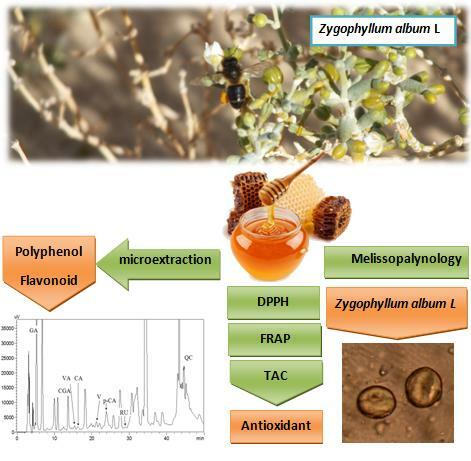 Only one prior study has analyzed the metabolites of Zygophyllum album L honey; it investigated sample from El-Oued. Thus, more studies are required to characterize Zygophyllum album L honey. This work is the first screening of melissopalynological and physicochemical characterization, at same time to determine in polyphenol and flavonoid contents of five samples of an Algerian honey with Zygophyllum album L as the main pollen source. In Algeria, this honey is called Bougriba honey. The results show that Zygophyllum album L honey possesses interesting physicochemical properties. It is a dark honey, has high acidity, high conductivity, high phenolic compound content and high antioxidant activity. These physicochemical properties differentiate this particular, dark variety of Zygophyllum album L from other Algerian honeys. An extensive investigation is needed to establish therapeutic characteristics of Zygophyllum album L honey.